I read Freeing the Baltic 1918-1920 about six months ago and as a result I was looking forward to The Naval War in the Baltic 1939-1945. Wow! I wasn’t disappointed. This book arrived a couple of months ago and I finally had a week where I read rather than painted figures or headed to the pub and this was on the top of the reading pile. The Naval War in the Baltic 1939-1945 was originally published on 17 May 2017 however it appears to have been sold out and is now due to re-release on 28 February 2018. The author is Poul Grooss. The book is 400 pages long with ISBN 9781526700001. Poul Grooss is a retired Danish Naval Captain whose career was 40 years long. He served as an intelligence officer and Soviet analyst. He also speaks Russian. He currently is a teacher at the Royal Danish Naval Academy. I reckoned I knew a bit about World War II and I also knew there was a lot I didn’t know. Reading Grooss’s book has reminded me of how little I do actually know. Grooss starts setting the scene in the book by describing the geography and the history of the Baltic region, then goes on to discuss the political manoeuvring and naval developments between the wars. His coverage of the 1939 to 1945 period starts with the attack on Poland then looks at the Baltic region through to 1941. Later chapters cover the attack on the Soviet Union to Spring 1942; the war between Spring 1942 and 1944; Spring 1944 to New Year 1944/1945; then from that New Year, month by month to the end of the war. He then looks at the aftermath of the war and a retrospective. The book is easy to read and Grooss has taken advantage of his Russian language skills to collect data from sources not usually referred to western histories. Grooss was writing for the general reader but has managed to write a book that will appeal to both general readers and the more professional historian. He covers and uncovers the degree of Swedish cooperation with the Germans. He covers the interactions between the Soviets and the Swedes and while this is a naval history of the Baltic, the land battles are included for context, especially Kronstadt and Leningrad. Hitler’s desire to hang on to Narva is also covered. The Baltic was a training ground for German U-boat crews but what really amazed me was the quantity of mines that were laid there and the amount of shipping that suffered. I should also mention that the Swedes were not as pro-German as we perhaps think, permitting the British to build a listening station on Swedish soil, for example. Both the Germans and the British seemed to have a laissez faire attitude to Swedish neutrality. This book is not all about Sweden though. Grooss also covers the minor states (Latvia, Lithuania and Estonia) as well as Denmark, Norway, Finland, Poland and of course the main protagonists. The book is supported by many fine photographs, most of which have not been seen in print before as well as well drawn maps. There are a number of appendices and indexes with an index of people and another of ships. There is an appendix containing a chronology of the conflict, a glossary of abbreviations, ranks, terminology and explanations. Another appendix is a cross-reference of place names in various languages as well as an extensive list of sources and bibliography. This book is one I will return to many times in the future I think. For the naval historian, the wargamer and the general reader, it is well worth waiting for this re-release and grabbing a copy. 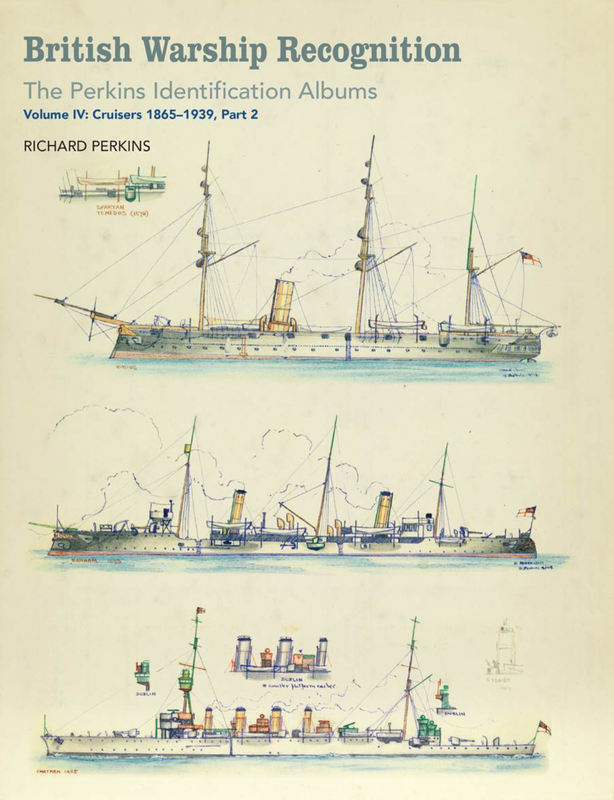 I reviewed Volume I in hard copy (Boy’s Own Battleships – Book Review) and Volumes III and IV in eBook format (British Warship Recognition – The Perkins Identification Albums – Volume III and IV Cruisers 1865-1939, Parts 1 and 2). I am kind of late getting to Volume II but I am enjoying it nevertheless. 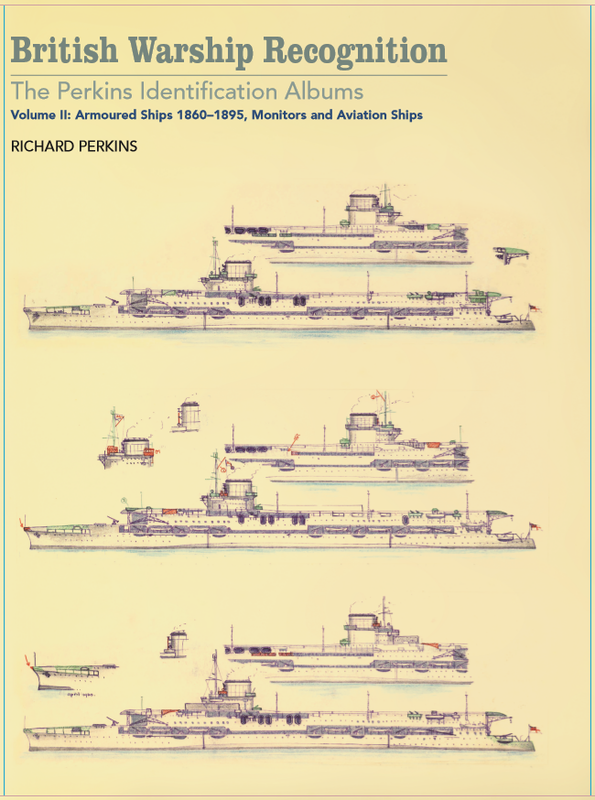 This is British Warship Recognition – Volume II: Armoured Ships 1860-1895, Monitors and Aviation Ships under the Seaforth Imprint, (ISBN: 9781848323865, published on 5 September 2016 of 224 pages). I noted before in previous reviews that a Perkins volume is not for everybody but for those who “get it”. I grew up with the wireless as dinner table entertainment; when to make a telephone call you needed to speak to an operator; and indeed, where telephone numbers were prefixed with the name of the exchange. Perkins’s hobby was photographing Royal Navy ships. He was such a keen amateur photographer that he photographed and ended up with one of the largest collections of photographs of warships. His collection of photos was bequeathed to the National Maritime Museum where it can still be seen today and where it forms the core of the historic photos naval section. While he was photographing he found many photographs were neither identified nor accurately dated. He then decided to compile an album of his own drawings incorporating as much detail as possible on the individual ships. He really looked closely at the details, the differences between ships of the same class and then differences in a vessel over time and used his drawings as a catalogue of his photographs. This book is one of what hopefully will be 8 volumes. 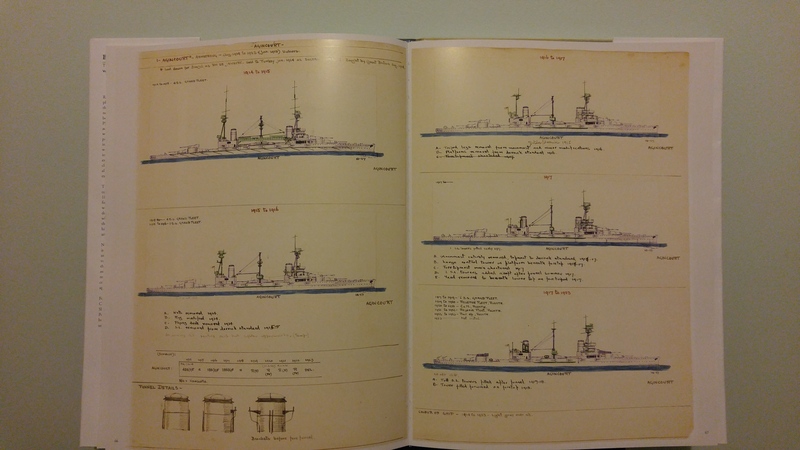 It is a photographic reprint of Perkins’s original art books where he set about to draw and paint the British fleet. There is really no other way this could be reproduced, even with the technical marvels available today and that still amaze this listener of the wireless. Perkins noticed over time that vessels changed – davits were moved forward, funnels thinned or thickened, smaller calibre weapons moved around the vessels, masts removed or changed, funnels added and so on. The ship illustrated in this review, the aircraft carrier HMS Eagle, is shown as she appeared in 1920 and then again later in 1923-1929. Also shown is the photograph of HMS Eagle held at the National Maritime Museum, N10504. The books are big but with Volume II and the rest of the collection they provide a unique view of the Royal Navy in the later 19th and early 20th centuries, a view that you will not see in a Brassey’s, a Conway’s or indeed a Janes. You may need a larger bookshelf or broader coffee table but the payoff is enjoying a cup of NATO standard, and flicking through the drawings and admiring his talent. 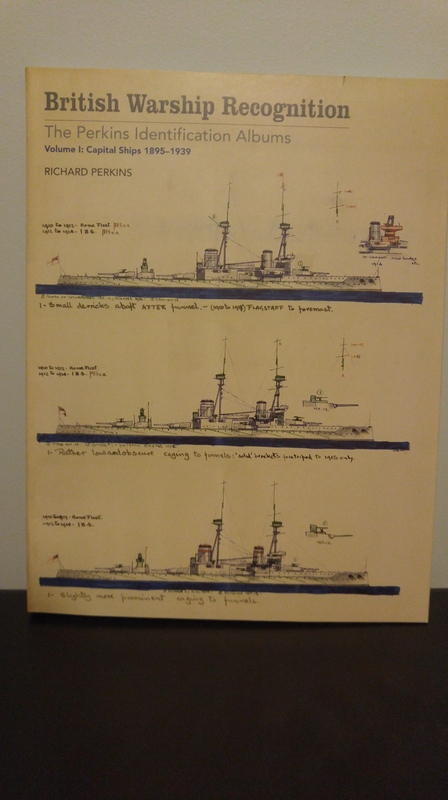 Back in June last year I was fortunate to get a copy of Volume 1 of the British Warship Recognition – the Perkins Identification Albums originally written/illustrated by Richard Perkins. Volume 1 dealt with Capital Ships 1895-1939 (ISBN 9781848323827). I had hoped to get to look at Volume 2 but the day job got in the way and I missed that release. Along came Volumes 3 and 4. Unfortunately because of the size of the book, I can’t get a physical copy for review. Really, it is a very big book. However, Pen and Sword books were happy to give me access to the electronic version of Perkins Volume III, Part 1, Cruisers 1865-1939. Perkins Volume III part 1 is published under the Seaforth Publishing imprint, is 192 pages long, ISBN: 9781473891456 and was published on 31 January 2017. It is available in hardcopy, as well as Kindle and ePub versions. I received the Kindle version for review. 192 pages long, ISBN: 9781473891494 and published on 14th June 2017. It is available in hardcopy, as well as Kindle and ePub versions. I also received the Kindle version for review. First, let me note that I loved Volume 1 in hardcopy, it is one of the favourites on my bookshelf. Perkins was a keen amateur photographer and he photographed and ended up with one of the largest collections of photographs of warships. His collection of photos was bequeathed to the National Maritime Museum, Greenwich where it can still be seen today and where it forms the core of the historic photos naval section. While he was photographing he found many photographs were neither identified nor accurately dated. He then decided to compile an album of his own drawings incorporating as much detail as possible on the individual ships. He really looked closely at the details, the differences between ships of the same class and then differences in a vessel over time. The British government asked him to stop is hobby at the commencement of World War 2 as they worried his works would provide valuable information to enemies. The Perkins Collection comprises some 11,000 photographic negatives and 8 illustrated recognition albums. The photographic negatives are from a time when a film allowed for 8 to 36 photographs so one can get an idea of the dedication of Perkins to his hobby. The publications are photographs of the pages of Perkins drawing books. This was seen as the best and probably only way to make these images available to modern readers. The two volumes for review cover the cruisers from 1865 to 1939. For example, the page to the right shows HMS Calliope Castor as she appeared in 1915 to 1917. He notes the “Calliope 6” included Calliope, Cambrian, Canterbury, Castor, Champion, and C0nstance. 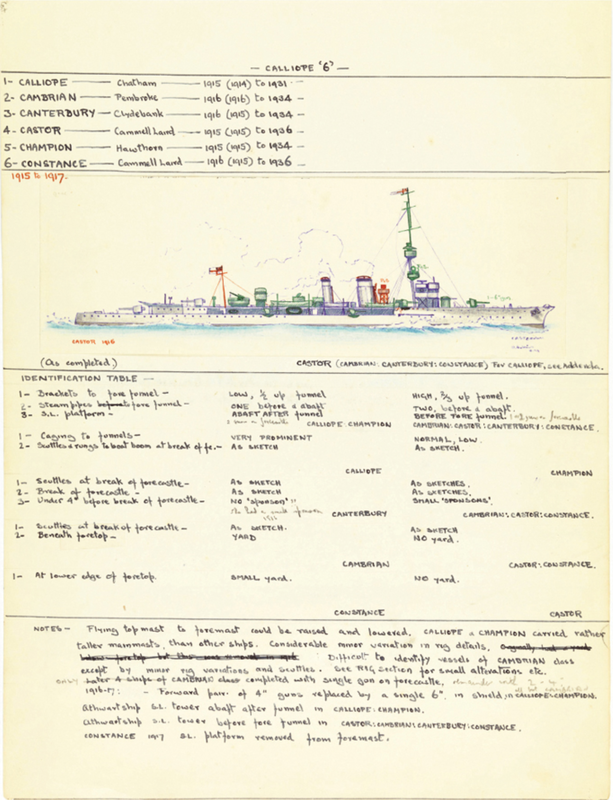 He notes the differences between the various ships in the class, as well as a watercolor painting of the vessels (only Caster is shown here). I must be honest, when I thought about reviewing the electronic versions, I wondered how well they would render on electronic devices. Pen and Sword kindly sent me links for the Kindle Version so I loaded both volumes to Kindle on my phone (LG G4 with a 5.5-inch screen), my tablet, (LG V700 tablet with 10-inch screen), and my PC. The images in this review came from the LG G4 (the top three) and the V700 (the last image). The images from the phone are higher resolution than the tablet and this can be seen with the difference between the final two images here. Having said that, the rendering of the physical book into Kindle format has been well done with the text present in the book resizing well after using the usual two-finger gestures. The images are clear enough in the tablet and PC and can be seen on the phone. Perkins notes really need to be read on PC or tablet however. Having said that, both books are a wonderful addition to a naval book collection. I will be honest and and say that I would prefer the hard copy of the books, they are the type of books that best savoured over a good java in one’s favourite reading chair, flipping between pages at whim and admiring the talent of Perkins while reaching towards Conway’s All the World’s Fighting Ships Volume 1 and 2 to verify Perkins details. I have no doubt that the hard copy of Volumes 3 and 4 are every bit as good as the hard copy of Volume 1. I can recommend the Kindle version for those of us with electronic reading devices, colour screens really being necessary to enjoy these works. I di like to be able to take my book collection with me when I travel and the electronic versions of these types of books have finally become every bit as god as the print versions. I can recommend these two volumes to anyone with a passing interest in the Royal Navy between the wars. Pen & Sword Military have produced the first volume of what will be a wonderful series of books. 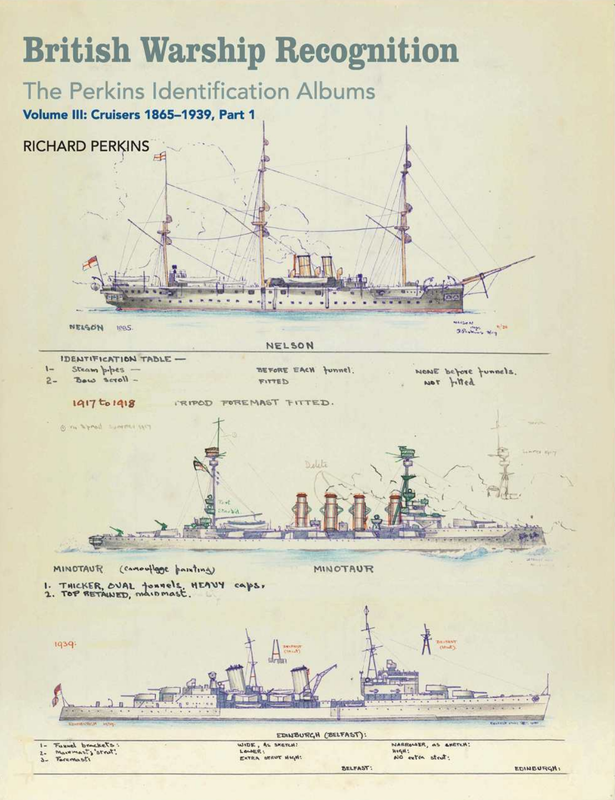 This is British Warship Recognition – the Perkins Identification Albums originally written/illustrated by Richard Perkins. This is Volume 1 dealing with Capital Ships 1895-1939 (ISBN 9781848323827). First off I must note that this book is not for everybody. It is a book that you will either love or “just not get”. The older reader (and I count myself in that group) who can remember part of their childhood being spent with an exercise book, coloured pencils and a book on, say German World War 2 aircraft and who then spent hours redrawing the aircraft from the pictures in the book will “get” thins book. I can understand what Perkins was attempting. Had I been in his position and possessed half his talents I would probably have done the same thing. Perkins was a keen amateur photographer and he photographed and ended up with one of the largest collections of photographs of warships. His collection of photos was bequeathed to the National Maritime Museum where it can still be seen today and where it forms the core of the historic photos naval section. Whole he was photographing he found many photographs were neither identified nor accurately dated. He then decided to compile an album of his own drawings incorporating as much detail as possible on the individual ships. He really looked closely at the details, the differences between ships of the same class and then differences in a vessel over time. This project grew into an enormous resource covering virtually every Royal Navy ship from 1860 to 1939, when security restrictions forced Perkins to stop work. The book is, in essence, a photographic reprint of Perkins’s original art books where he set about to draw and paint the British fleet. He then noticed over time that vessels changed – davits were moved forward, funnels thinned or thickened, smaller calibre weapons moved around the vessels, masts removed or changed and so on. He then decided to paint the differences in the vessels as he saw them. 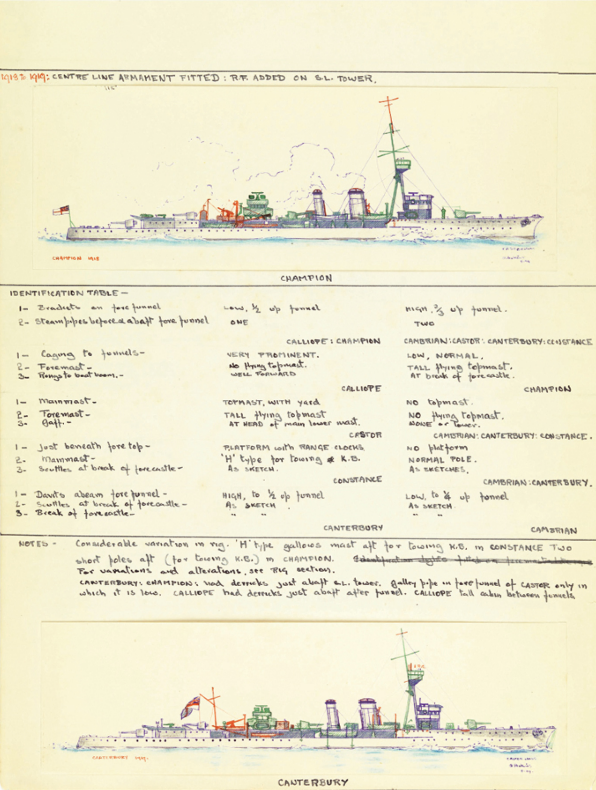 The example I selected is five slightly difference drawings of HMS Agincourt seen to the right. You will notice that I do not have any scanned images to illustrate but rather photographed off my phone. There is a reason for this. The book is big. A page was bigger than my scanner plate. I could not sit back in my favourite chair with this book in my lap. My lap is not big enough. To look through this I had the book placed on a table and work from there. The book however in and of itself is superb and the drawings speak for themselves. Younger readers may not understand the significance of this work but all will be able to appreciate the art involved. This book belongs in the collection of any naval enthusiast or historian. Best of all, it is the first of 8 volumes. The next volume is due for release in September this year – it will deal with Armoured Ships 1860-1895, Monitors and Aviation Ships. I for one will be interested int he aviation ships extant before 1895. As to Perkins’s first volume. One word. The good folk at Pen & Sword Military sent me a care package recently with four books in a very large package. I will look at the others later but the first book to take my interest is ShipCraft 22 dealing with German Battlecruisers. This book provides a useful companion to the modeller when engaging in a build of one of these vessels, however the images of Jim Baumann’s scuttled Hindenburg model in 1/700 scale alone is worth getting the book for! The ShipCraft range of publications are a combination of contemporary photographs coupled with colour references for paint schemes and a critical review of available model kits. 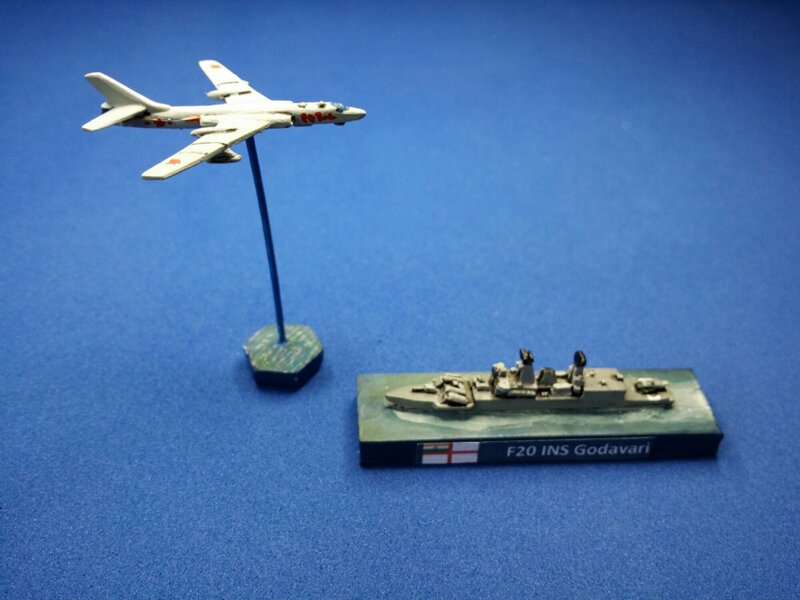 In short, they are the type of publication aimed at the ship modeller or perhaps naval wargamer to help get the colour and appearance of their models correct (or at least to the stage of “that looks about right”). The publication would also be useful to the naval enthusiast as well although to be honest, if looking for information on the vessels, the first book I would reach for when looking for would be my copy of Conway’s. If looking to paint some German Battlecruisers, then this publication would be first to come to hand. The book runs to 64 pages, a size familiar to modellers and. There are sections in the book covering Design; Careers; Model Products; Modelmakers’ Showcase; Camouflage Schemes; Appearance; Plans; and Selected References. The vessels covered in the book are Blücher; Von Der Tann; the Moltke class (Moltke, Goeben); Seydlitz; and the Derfflinger class (Derfflinger, Lützow). Mention is also made of the Battlecruisers that were not completed. The Design and Career chapters provide a reasonable summary, largely covering the service life of the vessels and briefly the battles they fought. There are some useful comparison tables as well. The table looking at the armament characteristics for example is quite useful and illustrates the difference in range for guns of the same weight (see the slight range differences between the 11” L/45 and the 11” L/50 guns). The next chapter deals with both the model kits available in plastic, resin, paper and white metal along with extras for gilding the lily on those kits. The extras discussed include photo-etched parts, wooden decks, brass gun barrels and masts to add a greater level of realism to the models. A fair roundup of the kits available is given. Next is for me the pièce de résistance, the chapter dealing with the work of many modellers. Work by the likes of Jim Baumann (perhaps the best ship/water modeller I have seen), Horst Luecke (I can’t believe it is a paper model), Kostas Katseas, and Nick Dogger amongst others. 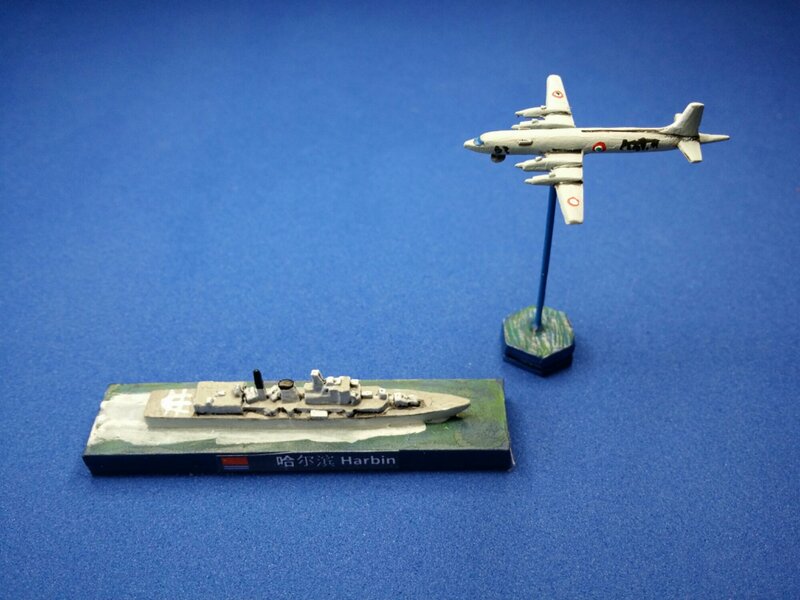 Baumann’s scuttled Hindenburg is special as well as the 1/700 scale crew on Dogger’s Lützow. Two colour illustrations follow, one of the Derfflinger in standard SMS colours circa 1917 and the other showing a camouflage pattern for the Yavuz (Goeben) circa 1942. There is then a discussion on the Appearance of each of the vessels noting the differences between sister ships. The section also discusses camouflage and the lack of it on German vessels in the First World War noting that the standard scheme for vessels was based around light grey. The book finishes with a number of plans and references. This book provides a useful companion to the modeller when engaging in a build of one of these vessels, however the images of Jim Baumann’s scuttled Hindenburg model in 1/700 scale alone is worth getting the book for! The authors are Robert Brown and Steve Backer with George Richardson drawing the plans and the colour artwork. It is published by Seaforth Publishing, ISBN 978-1-84832-181-6. The ShipCraft series of books are designed to provide information for modellers and enthusiasts. Christmas Day, I thought I rather than gloat over the gifts from this year I would, instead, start sorting and tidying up the lead pile under the house. First actual metal I ran across was a German Aeronef and British Land Ironclad pack, filed them! Next was some WTJ 1/3000 pre-dreadnoughts. Filed them as well. Checked then and packed them away. Came across a 1/1200 scale GHQ 74-gun Napoleonic ship of the line. Packed that away as well. Next was some Langton 1/1200 Ancient ships – Egyptian and Sea Peoples, 10 of each. Now I’m trying to decide whether to keep them or sell them. I’m leaning towards eBay. If anyone wants them, let me know here in the next day or so, make me an offer and I’ll see what we can do. There are 10 Sea Peoples boats and 10 Egyptian boats – one of which is a pharoah’s boat. A Chinese copy of the Tu-16 Badger overflows the Indian INS Godavari. Meanwhile an Indian Il-38 overflows the Chinese Harbin. Vanishing still to come and maybe a wee touch up of roundels to come. I had always intended getting a third or fourth modern fleet (megalomania? Of Course!). To join the Chinese and Indian fleets I purchased a Japanese modern fleet pack from Navwar code FPMD 5. Even after the arcane ordering process (I sent another letter through the mail to England) the postman brought me a parcel two weeks later. 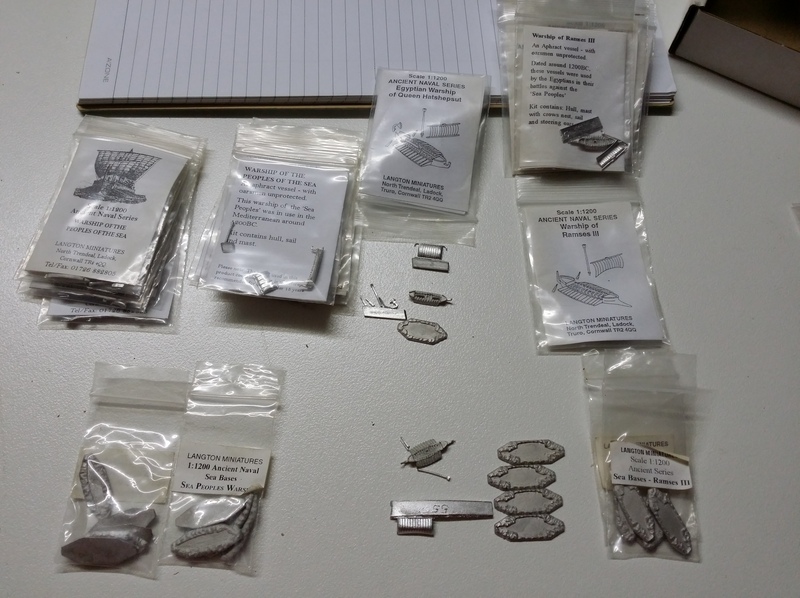 Included in the parcel was a 15mm DBA Mongolian Army for the lady – figures from Naismith Design and a modern Japanese fleet. This fleet pack, apart from providing some interesting opponents for the Chinese and the Indians, will also give me the chance to try a new (well new for me) basing technique to see if I can move away from the two-dimensional painted sea bases that I have done in the past. As we were speaking about Submarines the other day, Douglas sent me a link to the Telegraph. I will admit, I do prefer the UK Telegraph to the Australian abomination but I never really read the UK Telly all that much when I was there. Obviously, after this article, I should have. Oops. Seems the Australians are not the only ones with Submarine woes. Oh, and in the way of things, the S-80 is being named after Isaac Peral who is credited with designing and building the first practical submarine. And yes I know, the American Civil War produced submarines on both sides, Brutus de Villeroi being credited with the first of the Union ones, but these were all powered by hand. Peral’s had an engine!